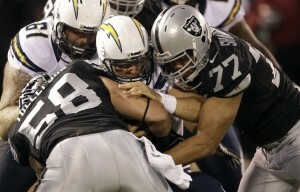 Raiders come away with second straight win against Chargers. It was another tight game between AFC West rivals. The Chargers had a great opportunity to tie the game with under 5 minutes left in the 4th, but Chargers quarter back Philip Rivers made a mistake of throwing an interception just outside the red zone. The Raiders took advantage of the interception and drove down the field to make it a 21-7 game. Chargers would score again with under a minute left to cut the lead to 7, but their onside kick was recovered by the Raiders. The Raiders will now take to the road to play against the AFC South champions Tennessee Titans. Carson Palmer played the type of game the Raiders werre hoping for. He finished the night with 262 yards, completed 11 of 16 passes, threw 1 touchdown and most importantly he had zero interceptions. As stated previously, this was a well tightly played game. The one key stat was the Chargers inability to get into the red zone. The Chargers had 303 yards of total offense, compared to the Raiders 293 yards of total offense. Yet, they only managed to get into the red zone two times and throwing the interception just outside the red zone late in the game proved to be a huge mistake that the Raiders capitalized on. This was the third meeting between the Chargers and Raiders this season and it was also the first game in which the winning team won by more then three points. The Raiders and Chargers split their regular season meetings, in week one the Chargers beat the Raiders at home 34-31, the Raiders returned the favor last week by beating the Chargers at home 30-27.